What kid doesn’t remember the great Bugs Bunny? We all grew up with good ol’ Looney Tunes, and I used to love how music was used as a vehicle to set up whatever crazy story Bugs was a part of. 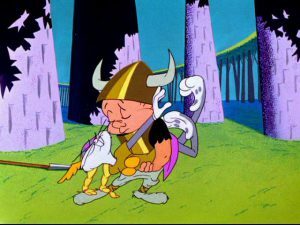 I can still hear the words “Kill the wabbit” sung to the famous melody from the “Ride of the Valkyries” from Richard Wagner’s “Ring Cycle”. As a child, however, I had no clue that the music in this cartoon was from an actual opera. I was spellbound by the way the cartoon fused music and drama, and who can forget Bugs always dressing as the heroine, with the wig and the horns? For those of you who haven’t seen these cartoons, read no further until you have watched these clips. I promise you will not be sorry. These two cartoons are based on two of opera’s most famous pieces: Richard Wagner’s Ring Cycle and Giachino Rossini’s The Barber of Seville. It is amazing how deeply rooted certain operatic motifs are ingrained in our memories. While not a part of these cartoons, I am sure we have all heard the words “Figaro, Figaro, Figaro” that also come from The Barber of Seville. These cartoons are so well known that some operatic productions use carrot jokes as a nod to the beloved Bugs Bunny. So, what is opera, really? Opera is a difficult word to define in a larger context, as many things fall under its umbrella, but in simplest form, opera is a theatrical work told through music and singing. Often people will add “without dialogue” to this definition but that opens a door to be discussed in a later post. You may also be wondering, “Isn’t musical theater also a theatrical work told through music and singing?” Well, you are correct. There are many similarities between opera and musical theatre, and the latter would not exist without the former. There is much nuance to discuss about the differences of these two amazing art forms but that, again, will deserve its own post to really do it justice. Opera has its origin in Europe, most specifically in Florence, Italy. In the 1500s, a group of men gathered in Florence called the Florentine Camerata. These men were poets, musicians, humanists, and intellectuals in the late Renaissance period. Their gatherings began a revival of Greek dramas and their musical experiments led to the development of “stile recitativo”. This singing style adopted the flow of normal speech and allowed for a story to be told, basically speaking on pitch. This became further developed and eventually led to the creation of opera. The first Opera was Dafne written by Jacopo Peri and produced in Florence around 1597. That is over 400 years ago! The libretto (the play, essentially) for this opera still survives, however, much of the musical score (the music) is, unfortunately, lost. The first “complete” opera score that we have dates to 1600 again by Peri and called Euridice. This first opera included dramatically sung moments, and more “half spoken” parts in the “recitativo” style developed by the Camerata. An excerpt from the 1600 score of Euridice. Since the writing of Dafne, countless operas have been composed by composers from many countries and in many languages, and many operas are still being written today! Popular composers you may know include: Mozart, Rossini, Donizetti, Verdi, Puccini, Wagner, Tchaikovsky, Gounod, Heggie, and many others. So that bring us to the end of our first Opera 101 post. In the future we will explore a few of the topics mentioned previously as well as addressing questions about opera as an art form and/or career. Feel free to ask any questions in the comments section, if you have any! Daniel Bates, opera singer, musician, foodie, and world traveler. Daniel sings all over the country; you can see where he is at danielbatestenor.com. Previous PostTony Awards Night 2017Next PostWhat’s Going Down in London Theatre? I hope that before your Opera series concludes, that you will at least mention the contributions of Gilbert and Sullivan. While some put these in a different category, the authors themselves called them operas, and they make a logical segue from classical opera to the modern musical theater that they foreshadowed.